Club Penguin Cheats by Mimo777 Club Penguin Cheats by Mimo777: Herbert P. Bear Sends Message! Ha ha! Now we know what make's "polar bear" angry! Phunnie! Now we can all try to make him mad! Hey mimo at the beach on the light houseif you click on the light you can change the background. cool! i think probot is gonna get so annoyed that herbert keeps calling him names and he will help us get him!! Hey Mimo!!! I have a glitch. So go to your furniture at your igloo, and go to an item that is already in your igloo. You know how when you have a furniture item in your igloo it's all blacked out in the back? Well the glitch is that if it's already in your igloo it'll say -4 or something weird like that. And here's the cool part: even though you may only have 1 of the item, you can still put it in your igloo!!! Wow! That is unusual. Normally, he would make fun of the EPF. Yeah. You are right. I think the Probot and Herbert are doing something weird. 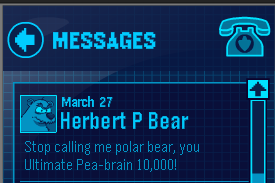 You know, I've always wondered, what does the P in Herbert P. Bear mean? Patrick? Peter? Phillip? That must mean in real talk, Ultimate Protobot 10,000. This must be a new and improved protobot! Hey Mimo! When you go to the beach and click the background, it will change! I think Herbert was calling Protobot this because he got the calculations wrong.